When it comes to losing weight, one simple piece of advice may be more helpful than all the diet books, calorie counting, and portion measuring put together: Eat more fiber. A recent study found that people who added more of it to their diets - without changing anything else - lost almost as much weight as people who followed the heart-healthy, low-fat eating plan recommended by the American Heart Association. The study added to a growing body of evidence that people who eat more fiber tend to have a healthier body weight. While high-fiber foods tend to be healthy (think: fruit, veggies, whole grains), what proved equally important was that this kind of diet was easier to stick to than the other, more structured approach. It's a carbohydrate found in plant foods like fruits, vegetables, and whole grains. Unlike other carbs, it isn’t easily digested by your body, so it passes quickly through your system without causing your blood sugar to rise. All fruits and vegetables have fiber, but it’s mostly concentrated in the skin, seeds, and membranes. That means an apple with the skin on has more fiber than a peeled banana. Some of the richest fruit sources of it are whole berries like raspberries and strawberries, says Tracie Jackson, RD, a nutrition therapist with the University of Nebraska Medical Center. "Rather than scooping grapefruit out of the little juice pockets, peeling it like an orange and eating it will give you more fiber, " she says. So how much do you need in order to lose extra pounds or stay at a healthy weight? Women under 50 years old should aim to get 25 grams of fiber a day, and men should shoot for 38 grams. Some experts recommend even more. Americans get only about half that, which means we're missing out not only on the weight benefit, but also a lower risk of heart disease and type 2 diabetes. 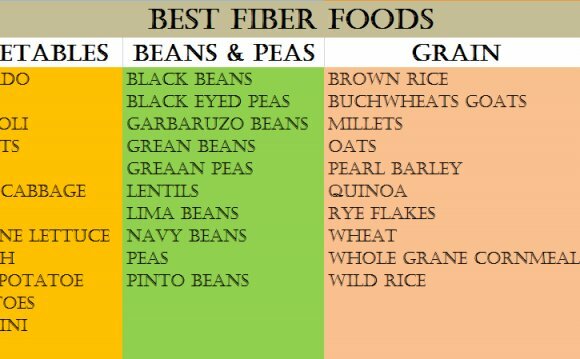 Fiber has no magical fat-burning properties. It simply helps you feel full without adding a lot of extra calories to your diet. When you have a baked potato (with skin) instead of a bag of potato chips, for example, you’re not only eating fewer calories - you’re less likely to feel hungry again an hour later.